An egg curry with hints of methi and a mild masala flavor. Yes, yet another methi based dish. 🙂 I have kept the recipe light, restraining the use of malai aka cream which yields a creamy rich dish. Play around with spices of your choice. 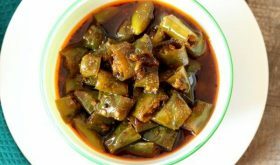 Makes for a quick and flavorful side with rice or rotis. 1 Heat half a tbsp of oil in a heavy bottomed vessel, add onions and saute till transparent. Add ginger-garlic-chilli paste and saute for 3 mts. Add methi leaves and saute for 4 mts. Add turmeric pwd, red chilli pwd, cumin pwd, coriander pwd and combine. 2 Add chopped tomatoes and saute further for another 4 mts. Add a little less than a cup of water and salt and bring to boil. 3 Add the boiled egg halves and let it cook in this masala for 7-8 mts on medium flame. Reduce flame and cook till you get the desired curry consistency. 4 Add garam masala pwd and combine. Turn off heat and serve hot with rotis or rice. 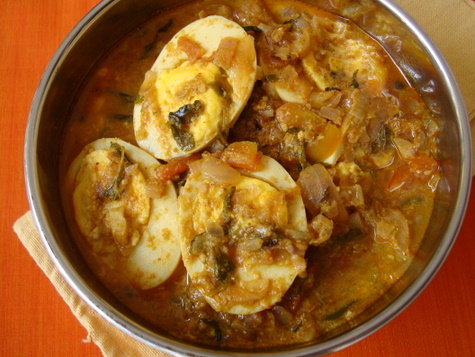 I have plans to make Egg Kurma too today, lovely dish you have created. Wish I could get fresh Methi here. I cant get fresh methi here. Can i use dried methi for this recipe? Yes, use about a tbsp of dried methi. today i will try this. thank you . Excellent recipe, i have a bunch of fresh methi and wondering what to do with it, you gave me a superb recipe. thanks. Can we substitute Methi with coriander leaves ? how wud that be ? or some other green leaves like palak? You can substitute with dried methi leaves OR coriander leaves but fresh methi leaves lend a unique flavor. I tried this recipe this weekend and it came out very well. I am a regular follower of your website and love all your recipe’s. Keep up the good work!! How much turmeric powder goes in? The description says to add turmeric but I don’t see the amount in the ingredient list. Also, could you add curd instead of water? Hi ! Tried it for lunch and it turned out so delicious, such an easy n quick recipe.